Really up until the point that the chequered flag fell had Lewis Hamilton been asked in advance to draft a script of how he'd like the Italian Grand Prix weekend to go it would not have deviated much from what he actually got. He entered it with a clear lead - upwards of a race win - on the next guy in the points, his habitual coat tail grabber and team mate Nico Rosberg. He entered the weekend also on the crest of a confidence wave. Out of the car he was quiet; answering questions with economy. But the sheer assurance he radiated was undeniable. Indeed he later said as much. "I woke up this morning and I felt super-strong" he said after the race. "Today I felt so strong; I felt like nothing could get in my way". Quite. He looked the quickest thing out there by far from the earliest Friday practice running, in a very quick and upgraded Mercedes. Brixworth having happily gobbled up its remaining power unit development tokens for the year, which left the rest even more breathless than normal. Pole was comfortable. Even better for him Rosberg - who looked a bit like he could play the role of irritant - after Saturday morning practice had to abandon his own new power unit due to technical problems and replace it with a previous and by now long-in-the-tooth and tired version (which had done six races), putting him out of striking range. 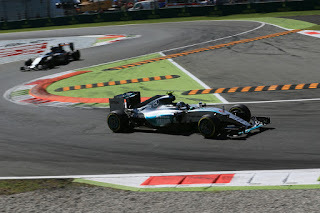 On race morning one potential threat was scratched, as it was confirmed that Nico's engine problem had been understood and would not impact Lewis. And as for the other main threat, that Ferrari might get the jump on him at the start and spoil his day from there, a la Hungary, well that didn't happen either. 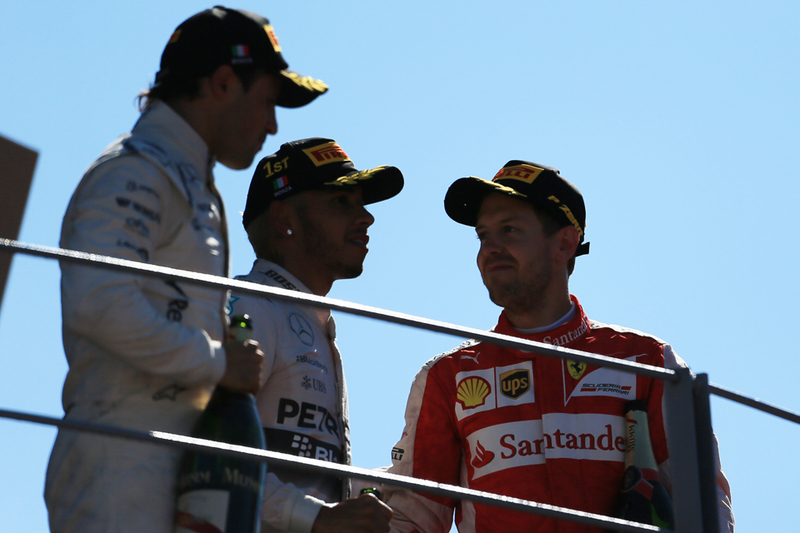 Kimi Raikkonen stalled and while Sebastian Vettel attacked Lewis was able to rebuff him. Within a few corners it already was transparently a case of Lewis vs. reliability for the win. He was the faster than all others as well as utterly under control, building on his lead with droning inevitability. Even his tyres weren't experiencing degradation. He made his solitary stop almost precisely on half distance, the stop went like a dream of course, and after that with everyone pitted he had over 18 seconds on the nearest pursuer Vettel. From that point he cruised. 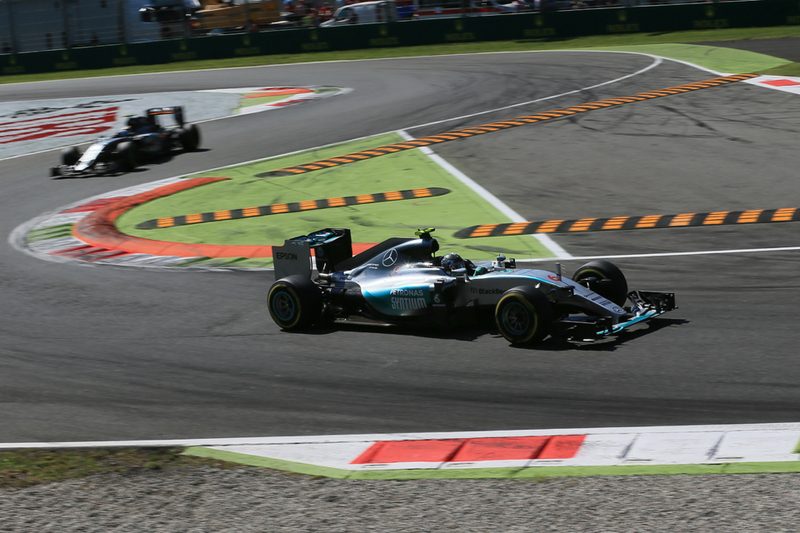 Then as if Lewis didn't have enough from his time in Monza's royal park Rosberg was consigned to nil points. He had a long drive from behind (he was rather impeded at the start by Kimi stalling in front of him) and was edging in on Vettel for second place late on, only for his engine to go pop with three laps left. It was Merc's first DNF of the season and it could hardly have come at a worse moment for Nico. It appeared that as he took the flag first the Englishman's already sizeable points advantage would be extended by the full 25. Almost too good to be true. Pretty much immediately though it looked like Lewis might be put in mind of the old saying that if it seems too good to be true, then it probably is. Lewis's win was threatened, seriously threatened, and from a source that no one had anticipated. No, it wasn't an actual opponent. Well not an on-track one anyway. No need to be silly now. We'd indeed by that point already got our first sense that things weren't quite as straightforward as looks suggested, when in the late laps and with first place for all the world appearing long since done Lewis was told by his engineer to push, and not to question why. Quickly observers surmised that the team was seeking to protect Lewis from the consequences of a post-hoc time penalty for some reason, perhaps of 25 seconds. 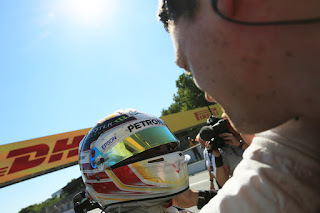 And it all became clear within minutes of Lewis taking the chequered flag. Tyres had once again been a lingering discussion point all weekend, with new reduced pressure and camber limits introduced for safety following the Spa Pirelli cuts and blowouts (though the actual levels got less harsh as the weekend went on). To this end the FIA's Technical Delegate Jo Bauer measured the pressures of the left rear tyres of the two Mercedes and two Ferraris on the starting grid after the five minute signal for the warm up lap was given - and found the two Mercs' pressure to be under the minimum starting pressure. And about an hour later during the race Merc was told about the trouble brewing, hence the call to Lewis (as an aside, Maurizio Arrivabene said after the race that Ferrari had no idea that Merc was under such a threat, and it struck me as a little unfair especially given Lewis indeed got his 25 second lead on the last lap thanks to Seb lifting before crossing the finish line). Minutes after the chequered flag it was confirmed to the rest of us that Bauer had referred all of this to the stewards. For a time that classic motorsport way of the stroke of a steward's pen rendering a drive we all thought we saw to in fact be an illusion looked possible, maybe even probable. Many reckoned that Lewis would be scratched from the results, and the case was to use that modern parlance a 'slam dunk'. But no. It seems that Mercedes was above board. Even though the reference was to minimum starting tyre pressure the understanding of the teams, as confirmed by Williams' Rob Smedley for one, is that the pressures are measured out of blankets. At this point, and as measured by a Pirelli engineer, the Mercs' pressures were kosher. Later when they were checked by Bauer it was when the tyre blankets were "disconnected from their power source, as is normal procedure", at which point the tyre temperatures had dropped and the pressures with them. 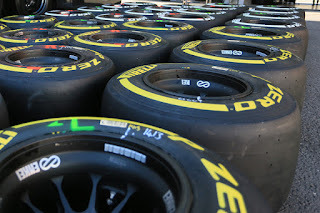 And the stewards accepted this argument, stating: "the Stewards are satisfied that the team followed the currently specified procedure, supervised by the Tyre Manufacturer, for the safe operation of the tyres". And while Smedley likened sticking to pressure minimums to sticking to car dimension limits the crucial difference is that the latter don't move (or at least, not beyond negligible levels) while tyre pressures do move depending on outside factors, not least heat. This created the bone of contention of when exactly the pressures are taken, and that it seems is where much of the confusion and problem laid. 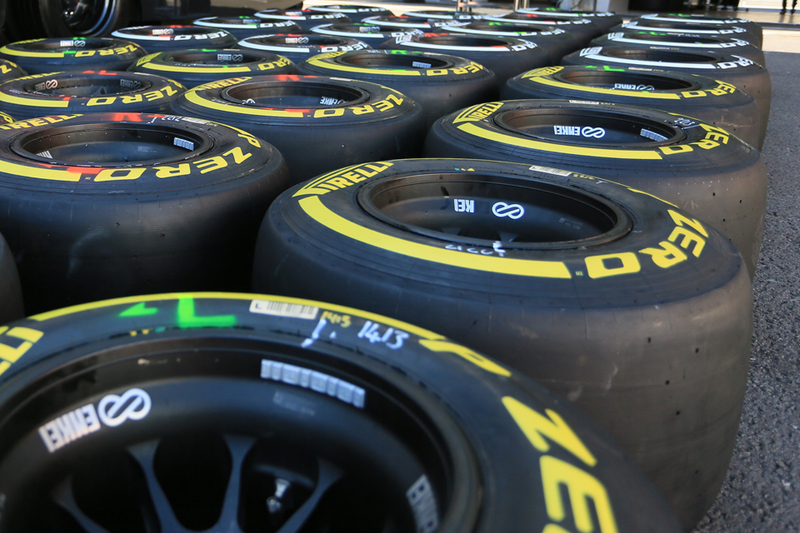 Indeed the stewards' statement indicated that the crucial take-out is that Pirelli and the FIA clarify this, stating: "the Stewards recommend that the Tyre Manufacturer and the FIA hold further meetings to provide clear guidance to the teams on measurement protocols". And as ever with such things too the more one delved the more problems were found. As Adam Cooper added also: "In what appears to be a case of miscommunication, the FIA had not been informed that Pirelli usually accepts the earlier measurement - with the tyres fully heated in their still connected blankets - as its definitive official "starting pressure"...So in effect it would seem that Bauer was wasting his time by measuring pressures in the last few minutes before the start, with the blankets disconnected." Pirelli doesn't emerge well, as it seems it didn't communicate with clarity to the FIA what the procedures for policing this should be. And given everything that's just gone before the Italian firm hardly could have done with a little additional egg on its face. As Mercedes boss Toto Wolff summed up: "It's now about the procedure going forward - when do you measure, how do you measure..."
While not for the first time lately the FIA has also struggled to uphold its own rule book, and as Will Buxton outlined the FIA also, right or wrongly, thought for much of the race that the Mercs' tyres were unsafe (as the pressure minimum is about safety), and yet took over an hour to tell the stewards about it (who in turn told Merc). What, Buxton argued, if they had been unsafe and there'd been an accident as a result in this time that the FIA was being coy? With all of this it was easy to miss the other stories out there from on track. Vettel pedalled hard to stay as close to Lewis as he could to take a fine second place that went down well with the locals. And another local favourite in Felipe Massa completed the podium. He often goes well here and just held off his team mate at the end who was benefitting from an offset strategy that gave him fresher tyres late on. Modest as always Massa joked that he was "getting too old for this". 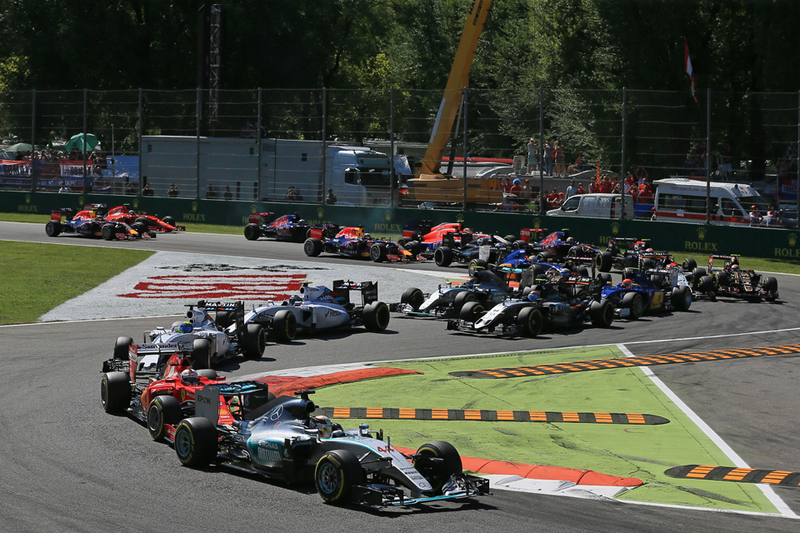 Kimi Raikkonen salvaged fifth despite being stone last in the run to turn one. He also lost ground later after being kept out rather a long time before his stop, possibly - cynics suggested - so to hold up Rosberg and thus protect Vettel. There then were two Force Indias, with Sergio Perez ahead and again showing good form (Nico Hulkenberg wasn't happy with his handling). Marcus Ericsson drove well as he had in qualifying to claim ninth, after being about the only one, aside from the two works Ferraris, through Saturday and Sunday to consistently get with the Merc-powered cars - indeed he shadowed Hukenberg all the way on race day. He described it as his best drive in F1, and also spoke eloquently of how he's improved more generally lately, as evidenced from this being his third points finish in a row. And Daniel Ricciardo also deserves praise for finishing eighth, or rather first in the non-Mercedes/Ferrari class, and was able to pass Ericsson in the run to the line with soft and fresher tyres. It was even easy to miss the big story of the day. The one about Lewis winning and doing so in the most decisive and imperious style we've seen in many a year. And even over and above this there is the even bigger story, that in Monza he took a giant stride towards his title number three. His points lead now stands at 53, more than two clear wins. And although seven rounds (or 175 points) remain we're now in the realms of that only occurrences such as falling getting out of the bath and missing a few races will deny him. Factor in also the way Lewis is driving right now. Indeed the thought occurs that Lewis's predominance can be stretched back to our previous visit to Monza 12 months ago, and has scarcely been interrupted since. In plenty of ways this seemed a fitting way to mark the full circle.